Diana V. Edelman is professor of Hebrew Bible/Old Testament in the Faculty of Theology at the University of Oslo. 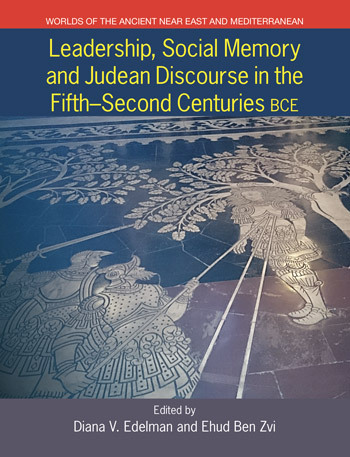 Her own research focuses on the history, archaeology, and literature of the southern Levant, the development of early forms of Judaisms, and ancient Near Eastern literature viewed from the perspective of social memory. She has thirteen seasons of excavation experience in Israel. While her research tends to focus on the Iron Age and Persian period, she is interested in earlier and later periods and a wide range of topics. Current interests include local responses to imperialism, royal ideology, the development of technology and agriculture, everyday life, issues involving religion and ritual, burial and afterlife beliefs, diaspora studies, migration studies, frontier studies, social memory, ancient economies, and ancient political organization. Her numerous publications include 17 authored or edited books, 44 chapters in edited volumes, 14 articles in refereed journals, 58 dictionary and encyclopedia articles, and 128 book reviews (as of 2/2015). Catherine Hezser is Professor of Jewish Studies at SOAS, University of London. Since 2017 she has also been Professor II (visiting professor) at the University of Oslo. She has published 8 single-authored monographs, 3 single-edited and 2 co-edited volumes, 75 single-authored articles in journals and book chapters, and 104 book reviews. Her area of specialization is the social history and daily life of Jews in Roman and early Byzantine Palestine. Amongst her most recent publication are Rabbinic Body Language: Non-Verbal Communication in Palestinian Rabbinic Literature of Late Antiquity (Leiden and Boston: Brill, 2017) and Bild und Kontext: Jüdische und christliche Ikonographie der Spaetantike (Tübingen: Mohr Siebeck, 2018). This volume explores different aspects of the interaction between religious authority and lived religion in Mesopotamian religion, Judaism, and Christianity, primarily in antiquity. The contributors represent a number of disciplines, resulting in a rich tapestry woven from specific case studies. The topics covered include: the level of participation of ordinary people in ancient Mesopotamian state religion and what sort of other religious experiences were open to them; strategies embedded in the five books of Moses to create and maintain group identity and cohesion in early forms of Judaism, the production and dissemination of religious knowledge within the Qumran community, the role of the synagogue in the dissemination of religious knowledge, the Thecla tradition and women’s religious knowledge in early Christianity, the interaction between rabbis and other Jews in private and public spaces in late Roman Palestine, the function of material culture in the dissemination of religious knowledge in ancient Christianity, religious knowledge and models of authority in sixth-century Gaza, folk religion (minhag) as a source of rabbinic jurisprudence, the transmission of religious knowledge publicly via schools and the concurrent private use of incantation bowls in Mesopotamia in the seventh century CE, the transmission of Jewish and Christian religious knowledge into the Qur’anic milieu at Mecca and Medina, and the role of rabbinic liturgy as a Medieval educational tool. Andrew George studied Assyriology at the University of Birmingham (1973–79). He wrote his doctoral dissertation on “Babylonian Topographical Texts” under the supervision of W. G. Lambert (1985). Since 1983 he has taught Akkadian and Sumerian language and literature at SOAS, University of London, where he is now Professor of Babylonian. His specialisms are Babylonian literature, religion and intellectual culture. He has been elected Fellow of the British Academy (2006) and Honorary Member of the American Oriental Society (2012). He is a former Visiting Professor at the University of Heidelberg (2000), Member of the Institute for Advanced Study in Princeton (2004–5) and Research Associate at Rikkyo University, Tokyo (2009). He was founding chairman of the London Centre for the Ancient Near East (1995–2000) and for seventeen years co-editor of the archaeological journal Iraq (1994–2011). His best-known books are a critical edition of the Babylonian Gilgamesh Epic for OUP (2003) and a prize-winning translation of The Epic of Gilgamesh for Penguin Classics (2000). More recently he has published six volumes of new texts from cuneiform tablets now in Norway. This paper will consider what constituted religious knowledge in ancient Mesopotamia and examine the means by which it was transmitted there. It will examine whether ordinary people had any access to state-sponsored religion and religious knowledge and explore what other religious experiences and practices were open to them. Sam Mirelman began his academic career studying music to doctoral level. Since 2004 he has studied Assyriology in London, Munich, Heidelberg and various universities in North America. His research interests include music and performance in the ancient Near East, Sumerian literature and Mesopotamian intellectual history. His PhD “Text and Performance in the Mesopotamian Liturgical Tradition” (2018, Institute for the Study of the Ancient World, New York University) is a study of the performance practice of Sumerian liturgical compositions, as shown by the evidence of late manuscripts. His British Academy postdoctoral research project (hosted at the School of Oriental and African Studies, 2018–2021) is entitled “Sumerian-Akkadian Language Contact During the First Millennium BCE”. It explores translation techniques between Sumerian and Akkadian, with a focus especially on “exegetical” translations. Relatively few studies have examined the elusive question of “popular” religion and cult in ancient Mesopotamia. The sources are sparse, and difficult to interpret. Cuneiform texts provide us with detailed information concerning Mesopotamian ritual practice, particularly for the first millennium BCE. However, such texts generally reflect the official cult, featuring the activities of priests, temple officials and the king. Despite the fact that relevant texts are focused on the ritual practices of elites, occasionally the general inhabitants of the city are mentioned. Such instances of public participation in ritual sometimes refer to public lamentation. For example, the “people of the land” participate in ritual laments during the Eclipse of the Moon Ritual, and during the repair of a cult statue. In addition, it is likely the general population participated as spectators at least, in the performance of regular temple laments during circumambulations in and around the city. Despite the paucity of textual references to the participation of the general population in Mesopotamian rituals, it is unlikely that the textual record fully reflects cultic reality. Although most people were not permitted to enter the temple complex, the general population participated from afar, in their homes or in the cities of ancient Mesopotamia. Given the extremely low level of reading and writing ability among the common population of members of the religious community of Israel in the Late Persian and the Hellenistic periods, some mechanisms for disseminating basic tenets, beliefs, values, and practices would have been needed. Working against the background of Symbolic Convergence theory, I will explore some of the key strategies that were embedded in the five books of Moses by their implied authors to create and maintain group identity and cohesion. Whether the authors or strategies were successful or not is another matter. We lack appropriate evidence to assess how many became part of the lived religion of ordinary Israelites or if the original intentions were modified or new meanings were assigned to any of these key strategies by practictioners. Key tenets and beliefs will be identified by exploring what the writers emphasized must be remembered, taught, or learned. The practices of circumcision, weekly Shabbat observance, mezuzot, tefillin and participation in the three annual pilgrimage festivals will then be explored to consider further how the framers of the books of Moses hoped to involve all members of the community in sharing common beliefs, values, and practices through rituals. A final section will look at portrayals of active and implicit teaching of torah by the Levites in the books of Chronicles (2 Chr 17:17-19; 1 Chr 26:30-32), which likely reflect contemporary practice in the Hellenistic era that has been retrojected to the monarchic era to serve as precedent for the subsequent development. Such teaching seems to go beyond the original strategies put forward in the Torah. David Hamidović, Ph.D. at Sorbonne University (Paris) in History of Antiquity, is Professor and chair of the division, “Jewish Apocryphal Literature and History of Judaism in Antiquity”, at the University of Lausanne (Switzerland). The analysis of the textual cluster of serakhim relating to the Rule of the Community enables us to consider the production and dissemination of knowledge within the Qumran community itself. The literary genre of serakhim demonstrates the transformation of oral traditions into written format and of writing into orality within the community. The columns 5, 6 and 9 of 1QS describe this process at work. Assuming that we are dealing with a composite text here, I explain the production and dissemination of knowledge by re-contextualising the concept of mishpatim that constitute the background of the serakhim. Philip Alexander is Professor Emeritus in post-biblical Jewish Literature from the University of Manchester, where he taught from 1995–2010 in the Department of Religions and Theology. Prior to that, he was a fellow at St. Cross College, Oxford, a lecturer in the Hebrew Centre of the Oriental Faculty at Oxford, as well as President of the Oxford Centre for Hebrew and Jewish Studies. More recently he has been a visiting professor at Liverpool Hope University (2012), the University of St Andrews (2016), and the University of Chester (2017) and Currently, he is a Principal Investigator of the Hebrew Manuscripts Cataloguing Project at the John Rylands Library, Manchester (2018–). His publications have investigated aspects of Judaism in the Second Temple and Talmudic periods, early Jewish interpretation of the Bible, particularly Midrash and Targum, and the relationship between Judaism and Hellenism. In this paper I borrow the anthropological concept of “a great tradition” and “a little tradition” to explore the theme of the use and dissemination of religious knowledge. I argue that the relationship between the elite “great tradition” and the popular “little tradition” should be seen as a two-way street: the traditions dynamically interact, the “little” playing as crucial a role as the “great” in the overall definition of the religion. I argue this specifically for Judaism by tracing the interaction between custom (Minhag – taken roughly as folk-religion) and law (Halakhah – the Rabbinic definition of religious practice). Starting out from a close analysis of Hillel’s dictum, “Leave it to the people. The holy spirit is upon them. If they are not prophets they are sons of prophets” (Tosefta Pesahim 4.13-14 and parallels: Yerushalmi Pesahim 6.1, 33a-b and Bavli Peshaim 66a-b), I sketch the incorporation of Minhag into Halakhah from antiquity to modern times. Drawing on Legal Positivist analysis of English common law I discuss the “rule of recognition” which was applied by the Rabbis in accepting custom as law, and identify, with concrete examples, four Rabbinic attitudes to Minhag: (1) acceptance; (2) modification; (3) rejection; and (4) toleration. Thus, from an internal analysis of the Jewish legal tradition itself I argue that folk-religion is recognized by the Rabbinic elite as having made a significant contribution to Judaism. What the elite gave to the people, the people in many cases already owned. Palestinian rabbinic literature mostly transmits traditions about interactions among rabbis and rabbis and their students. Nevertheless, in some social contexts rabbis are said to have met laypeople: rabbis were invited by wealthy householders; they attended study houses; they gave speeches in study houses and synagogues. This paper examines the private and public contexts in which interaction between rabbinic Torah scholars and other Jews is imagined in Palestinian rabbinic sources of late antiquity. How are relations between rabbis and laypeople depicted in comparison to those amongst rabbinic scholars? Are rabbis and non-rabbinic Jews described as equals or do the texts contain implicit or explicit markers of status differences? Questions about spatial access to rabbis are closely linked to the issue of transfer of knowledge. It is argued that rabbis’ actual behaviour and practice in public spaces may have been more important than verbal instruction. Rabbis could serve as role models for those who observed them. Since Judaism focuses on practice rather than beliefs, rabbis’ conduct in everyday situations would have been the foremost way of disseminating rabbinic knowledge. Anders Runesson, Ph.D. (Lund; 2001), Docent (approx. Dr Habil; 2002). Since 2015 Professor of New Testament University of Oslo. Previously Professor of Early Judaism and Early Christianity, McMaster University, Canada (2003–2015). Author and editor of nine books and over 50 articles in academic journals and edited volumes. Latest monograph: Anders Runesson, Divine Wrath and Salvation in Matthew: The Narrative World of the First Gospel, Minneapolis: Fortress, 2016 (2017 winner of the Frank W. Beare Award for an “outstanding book in the areas of Christian Origins, Post-Biblical Judaism and/or Graeco-Roman Religions.”). Other relevant books: The Origins of the Synagogue: A Socio-Historical Study, ConBNT 37. Stockholm: Almqvist & Wiksell International, 2001 (winner of the Biörnstjärnska Award, The Royal Academy of Letters, History and Antiquities, Stockholm, Sweden, 2003; and the Westrupska Award, The Royal Academy of Humanities, Lund, Sweden, 2004); The Ancient Synagogue From its Origins to 200 c.e. : A Source Book. Ancient Judaism and Early Christianity, Series 72. Leiden: Brill, 2008 (with Donald D. Binder and Birger Olsson). The origin and nature of the institutions we call synagogues today provide us with important insights into how Jewish religious knowledge—as intertwined with the political—was disseminated in antiquity, and why. This paper argues that the two types of institution concealed behind English translations of the primary sources (the ancient material applies seventeen Greek, five Hebrew and three Latin words for what is translated into English as ‘Synagogue’) were key instruments for forming and maintaining Jewish religious, social, and political identities far beyond elite groups. Each type of institution did so, however, in different ways and with different aims and results. In both cases, though, the presence of diverse social strata, as well as of women, in such institutional contexts problematizes common understandings of the ancient world of who were involved in knowledge production. The results of the investigation have implications not only for the study of Judaism and Christianity, but also for how we understand the degree to which these traditions were integrated in Graeco-Roman society, and how they spread in non-Jewish settings. Stefan Reif is Emeritus Professor of Medieval Hebrew Studies and Fellow of St John’s College in the University of Cambridge. He also holds senior research posts at the Universities of Haifa and Tel Aviv. He was the Founding Director of the Genizah Research Unit at Cambridge University Library (1973-2006). His latest volumes are Jewish Prayer Texts from the Cairo Genizah (2016) and Jews, Bible and Prayer (2017). In an earlier paper, I began to examine the role of rabbinic liturgy as an educational tool. I dealt there with the biblical readings and citations from Talmudic literature that were incorporated into the standard rabbinic liturgy from Talmudic to late medieval times. In the present paper I pursue this topic further, discussing some sections of the introductions to the rabbinic prayer-book by various liturgical commentators from the tenth to the seventeenth centuries in the eastern and western worlds, and considering the possibility that educational elements may be traceable there too. I also pay some attention to liturgical poetry and how it also contributed to such a pedagogical process. Hugo Lundhaug is Professor of Biblical Reception and Early Christian Literature at the University of Oslo, Faculty of Theology, and scientific director of the interdisciplinary research school Authoritative Texts and Their Reception (ATTR). He has published books and articles on Coptic manuscripts and literature, monasticism, apocrypha, new philology, and cognitive theory, including Images of Rebirth: Cognitive Poetics and Transformational Soteriology in the Gospel of Philip and the Exegesis on the Soul (Leiden: Brill, 2010) and the co-authored (with Lance Jenott) The Monastic Origins of the Nag Hammadi Codices (Tübingen: Mohr Siebeck, 2015). This article addresses the dissemination of religious knowledge by means of apocryphal texts and traditions transmitted in Egyptian monasteries from late antiquity to the early Islamic period. Placing the apocryphal texts of the Nag Hammadi Codices within the broader context of Egyptian monastic literary practices, looking at monastic manuscript collections from the fourth to the twelfth centuries, the paper argues that the production and use of Apocrypha was not a marginal phenomenon in Egyptian monasticism. On the contrary, the transmission of Apocrypha played a significant role in the distribution of religious knowledge. Dr. Erica C.D. Hunter is Senior Lecturer in Eastern Christianity and co-Chair, Centre of World Christianity, Dept. of History, Religions and Philosophies, SOAS. She held an AHRC Large Grant (2008-2011) for her project, “The Christian Library from Turfan”, and a second AHRC Large Grant (2012-2015) for her project, The transmission of texts at Turfan”. She has a particular interest in the ethno-religious communities of Mesopotamia during the Late Antique-Islamic eras. As the Gertrude Bell Fellow of the British School of Archaeology in Iraq (1989-1990) she researched the Aramaic, Syriac and Mandaic incantation bowls in the Iraq Museum. She has written many articles on incantation bowls and assisted Prof. J.B. Segal FBA in the publication, A Catalogue of Aramaic and Mandaic Incantation Bowls in the British Museum (London: British Museum Press, 2000). This paper considers the dynamics of the transmission of religious knowledge in both the public and private arenas amongst the Christian communities in Mesopotamia during the Late Sassanid-Early Islamic period. Formal transmission of knowledge, via the schools, the most notable being the School of Nisibis, saw its realisation in the mid-7th century compilation of the Hudra, the annual ecclesiastical cycle of services in the Church of the East. In stark contrast, the interpolation of Christian formulae into a small number of Syriac incantation bowls affords unique insight into the changing religious landscape of southern Mesopotamia. Written for both men and women, the texts show the adaptation of traditional incantation formulae to assimilate Christian elements and are indicative of vernacular religious beliefs. Annette Weissenrieder is Professor of New Testament and Director of the Corpus Hellenisticum Institute, University of Halle-Wittenberg. Her main areas of research include the Corpus Hellenisticum, with an emphasis on Graeco-Roman medicine and philosophy, the architecture of ancient temples and houses, the Pauline letters, the letter to the Ephesians, and Luke and Matthew in the Vetus Latina. The literary culture of ancient Christianity is often thought to reflect the concerns and preferences of the cultural elite. Material evidence provided by archaeological research is increasingly employed together with building inscriptions to overcome this bias in the study of ancient Christianity and gain access to experiences of non-elite Christians. This paper explores the role of the visual, space, and epigraphic material in helping to disseminate ancient religious practices, rituals, and beliefs in ancient Christianity. 1 Corinthians will serve as a case study. Concepts of space include connections between the outside and the inside in houses and collonaded halls and the aesthetics of self-representations in “lower” and “upper” class symbols conveyed through the choice of building materials and techniques of construction. Christine Amadou (Dr. art., University of Oslo, 2006) is an historian of ideas and Associate Professor in the Department of Philosophy, Classics, History of Art and Ideas (IFIKK) at the University of Oslo. She has published primarily on late antique Christianity and on subjects from the history of religions and political ideas, particularly those with a gender perspective. Her current research centres on antique reception and different “uses of the past,” as well as on late antique and early Byzantine hagiography. The story of saint Thecla invites a wide range of readings. It tells about women’s religiosity in early Christianity, of the written medium, and of the saints’ missionary activities. The figure of Thecla is represented in a variety of literary genres, from hagiography to philosophical dialogue (Methodius). What do the different genres say about the transmission of religious knowledge and how do they themselves transmit it? How should we read the female, gender-related aspect of this path of transmission? In my contribution I will use theories of the History of Knowledge and the History of Ideas to explore the figure of Thecla as a transmitter of religious knowledge and examine how the different genres reflect this process in three texts. In The Acts of Paul and Thecla I highlight the special and gendered relationship between chastity, knowledge and authority. In The Miracles of Thecla I focus on the miracles connected to reading and writing and thus to a scriptural knowledge, and in Methodius’ Symposium I examine what happens when female knowledge of chastity is extracted from an ecclesiastical context. Through these three readings I will explore questions of gender and religious knowledge and see how divisions between popular and elite religiosity have to be nuanced when women’s access to knowledge and authoritarian positions are taken into account. Jan R. Stenger, 2003 PhD University of Kiel; 2008 Habilitation, University of Kiel; 2008-2012 Junior Professor of Classics, FU Berlin; since 2012 MacDowell Chair of Greek, University of Glasgow. Religious instruction in the polis of Gaza and its surroundings is very well documented for the first half of the sixth century. We possess a large number of texts which disseminate to a mixed audience of laypeople knowledge about the Bible and Christian doctrine and discuss questions of pious conduct. Intriguingly, religious instruction was given by figures of different status and in widely different settings, but in all likelihood addressed the same audiences. In the vicinity of Gaza, two recluses were regularly approached by townspeople on matters of everyday life, but also on doctrinal controversies; the answers were given only in written form. Within the polis, secular teachers, the sophists of the local school, occasionally touched upon religious topics in front of gatherings of the civic community. This chapter first analyses these different settings of dissemination of religious knowledge, the types of knowledge, the participants and the types of discourse. It then differentiates between two models of authority and relates them to the teaching settings. The analysis demonstrates that the dissemination of religious knowledge was embedded in the traditional polis culture, rather than being treated as a separate domain, and that religious instruction was not confined to religious functionaries and specialists. Holger Zellentin (PhD Princeton University, 2007) is Lecturer in Classical Rabbinic Judaism at the University of Cambridge. He has previously held faculty appointments at the University of Nottingham and at the University of California and the Graduate Theological Union, Berkeley. His research interests include Talmudic culture in its various historical contexts, as well as Qur’anic law and the Qur’an’s engagement of the Jewish and the Christian tradition. His publications include The Qurʾān’s Legal Culture: The Didascalia Apostolorum as a Point of Departure (Tübingen: Mohr Siebeck, 2013) and Rabbinic Parodies of Jewish and Christian Literature (Tübingen: Mohr Siebeck, 2011). The reconstruction the modes of transmission of knowledge into the Qur’anic milieu has always been a contentious topic. Already the prophet’s opponents themselves are reported to have challenged him as deriving his knowledge from an informer, whereupon the Qur’an rectifies them: “The language of him to whom they refer is non-Arabic (aʿjamiyy), while this [Qur’an] is [in] a clear Arabic language (lisān ʿarabiyy mubīn)” (Q 16:103). Any study of the transmission of knowledge therefore has to unload the burden of millennia of inter-cultural polemics. This study proposes to do so by concentrating on three preliminary issues. First, it will probe the interface of Arabic and non-Arabic traditions that are relevant for the Qur’an—mainly Hebrew, Aramaic and Syriac. Secondly, it will present a brief survey of those Jewish and Christian texts that are of specific relevance for the Qur’an. Finally, it will turn the tables on the usual mode of inquiry and ask what the Qur’an, in turn, can teach us about the specific forms of Judaism and Christianity in its milieu. The paper will argue that the question of the transmission of knowledge into the Qur’anic milieu can only be addressed in a meaningful way once a more precise reading of the text in light of and as evidence for Late Antique religious discourse has been established.